Here is the perfect, full fragrance, high performance cleaner formulated for both delicate floors like marble, terrazzo and slate as well as timber floors, yet with the power punch detergency to remove heavy grime buildup and sludge found in Supermarkets and fruit and vegetables markets. It is a non acid and non alkaline formula so SUPASTAR won’t blush, burn or bite at your gloss or haze the thinnest of floor sealer coats. Without the greasy residue found with normal detergent you’ll find it a great performer on ceramic and quarry tile - and it won’t leave a slippery residue. 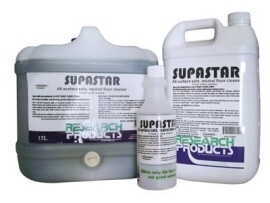 As the name suggests, SUPASTAR is the suggested cleaner where the SUPAGLOSS sealer finishes are used. It works brilliantly with MARBLETECH as it does on all our floor sealer finishes. Because SUPASTAR contains nothing that degrades the life of the sealer finish (like ammonia, silicates and solvents) you can expect longer life from your floors. 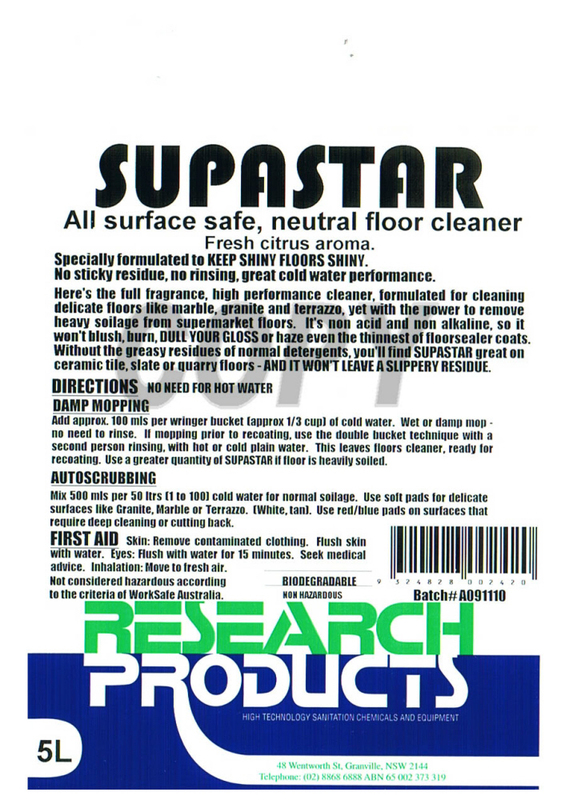 Whilst not a cloying harsh fragrance, the fresh citrus aroma generated when SUPASTAR hits the water will give your clients the air freshness they deserve. Your staff will love it too. SUPASTAR is ideal for light cutting back of floor finishers. Dilute 1 part SUPASTAR to 20 parts water, leave on for a few minutes and scrub with a blue or green pad and rinse prior to recoating.